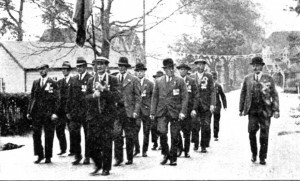 In the weeks before Coronation Day, a Coronation Committee was set up to organise events and to raise the funds to pay for them. The committee raised £70 1s from subscriptions and donations. A further £1 19s was raised throught the sales of the programme or events priced at at 1d. each. Each programme sold had a number on it which was entered into a draw for a prize of 10 shillings. The winner, with the lucky number of 23, was Jack Foster of Popes Row. 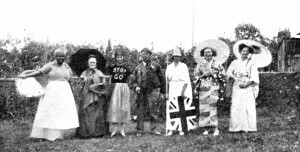 In the days leading up to Coronation Day the residents of Kilndown had been busy decorating their homes with bunting, streamers flags, banners and whatever else they could find or make. There would be prizes for the best decorated houses. Coronation Day was officially begun in Kilndown when the church bells rang out at 9.30am. 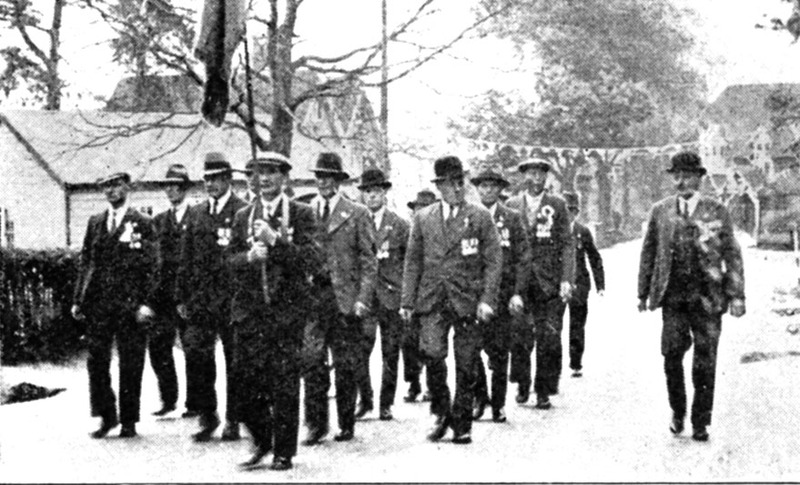 At 10.15am the members of the British Legion paraded outside their headquarters then marched with their colours to the school where they were met by the vicar of Christ Church, Rev. F.F. Komlosy, and the choir. The Union Jack was hoisted on the school flagstaff while the National Anthem was sung. 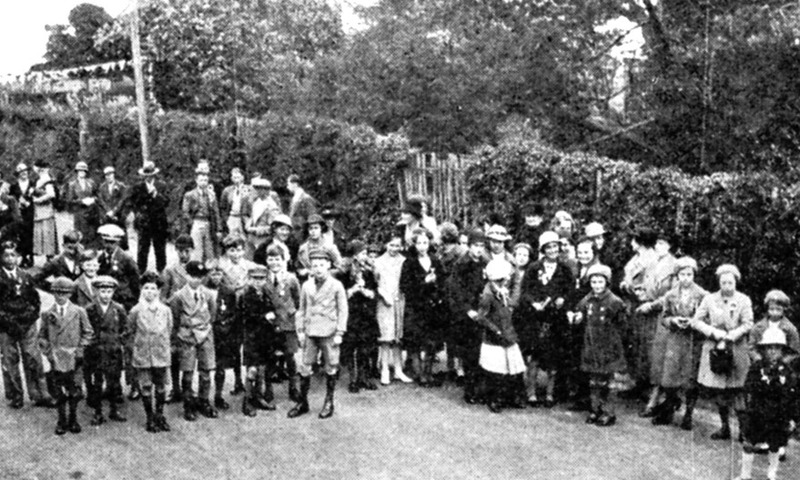 The parade then re-formed and marched to the church, where a large congregation had gathered, and a special Coronation Day service was conducted by the vicar. 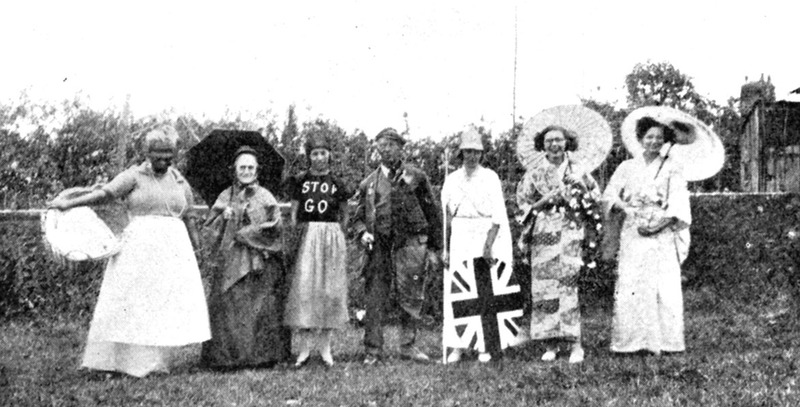 At 1.45pm a Fancy Dress parade was due to process from the Parish Room to the Cricket Ground. Unfortunately, it had rained and the procession had to be cancelled but the parade went ahead in the Parish Room with 68 entrants. Mrs Hussey, Miss Bickersteth, Mrs Gosling and Mrs Komlosy judged the entries in the various classes, including fancy dress and decorated prams and bicycles. Mrs Hussey then presented the prizes to the winners including that for the best decorated house in the village which had been judged the previous day. Sports for the children had been arranged for the afternoon but, because it was raining, they were cancelled. Instead Tea was served around 3.30pm as soon as the prizes had all been presented. 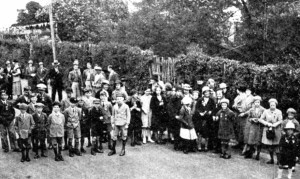 The children had their tea in the schools and each child was given a Coronation mug, a medal, a flag and a new threepenny piece. Any child not able to attend the tea was also given the souvenir gifts. In all, 121 children and babies received souvenirs. In the meantime, the adults’ tea was served in a decorated marquee sited in the orchard at the Globe and Rainbow. There was no special tea arranged for the Old Folk of the village, but they were all later given a gift of tea or tobacco. By early evening the rain had cleared and the adult sports at the Cricket Ground went ahead. However, it was decided that the children’s sports should be postponed to Empire Day, May 28th. During the evening the King’s Empire Speech was broadcast on radio and it was relayed to a large crowd who had gathered in the Parish Room to hear it. Then, at around 9.30pm, there was a grand firework display at the Cricket Ground followed by the lighting of a huge bonfire on the school playground. The evening’s celebrations were rounded off with a Social gathering in the Parish Room where villagers of all ages joined in the songs and games. At midnight refreshments were served followed by dancing until 2.00am the following morning when celebrations were brought to a close.